AFMC has been doing utilization review for more than 45 years. AFMC’s review work helps providers meet quality of care standards and ensures that claims paid are medically necessary. Reviews help prevent fraud and abuse on behalf of both public and private health plans, as well as save health care costs by not reimbursing for medically unnecessary care or care not supported by the patient’s medical records. Established in 1972 as a nonprofit Professional Standards Review Organization, AFMC monitors the appropriateness, quality and outcome of services provided to beneficiaries of Medicaid, Maternal and Child Health and private insurance companies. Currently, AFMC reviewers perform medical case reviews for prior authorization, retrospective and concurrent utilization. In addition, AFMC has achieved URAC-accredited status for its independent review services, ensuring that we have “a proficiency in providing knowledgeable and credentialed reviewers free of conflicts of interest.” Choosing to achieve URAC accreditation demonstrates AFMC’s commitment to quality, accountability and consumer protection. URAC is an independent, third-party, health care quality validator that uses evidence-based measures. URAC relies on multidisciplinary expert advisory groups to guide development of evidence-based standards. AFMC uses a web-based review through AFMC ReviewPoint® for inpatient continued stay and most other types of review. Reviews and prior authorizations are conducted by our URAC-accredited health utilization management review team that includes physicians and nurses. Reviews start when health care providers submit requests to determine medical necessity or the need for services. Retrospective reviews for Arkansas Medicaid are performed on paid claims. The medical record submitted to support the claim is first sent to the AFMC reviewer, who is a registered nurse specializing in the designated area of care. “Nurse reviewers have the power to approve cases based on policy and/or approved criteria,” according to Dr. Tinsman. “If they cannot approve, it must be sent to a physician who makes the decision about medical necessity, based on how a physician would handle this case, if this was his or her patient,” he added. Each review is individualized and includes key elements from the medical record to support the final decision. Specific reasons are required to justify why services are not medically necessary. “In reviewing at the nurse level, we look for medical records that support medical necessity, says Jarrod McClain, AFMC’s director of clinical review. “At the nurse level, a review is either approved or referred to a physician for determination,” he added. At the completion of each review, a letter is sent to the patient and health care provider notifying them of the determination. “If the request is not approved, the provider has an opportunity to request reconsideration of the determination,” McClain says. AFMC denial notifications contain case specific information explaining why the review was not approved. Dr. Tinsman adds that AFMC believes it is important to have Arkansas-licensed physicians reviewing the work of Arkansas physicians. AFMC has made many changes over the years to improve the quality, efficiency and security of its review work. Technology has helped us improve the review process. AFMC ReviewPoint® was launched in 2017 to make review requests easier, faster and more secure. 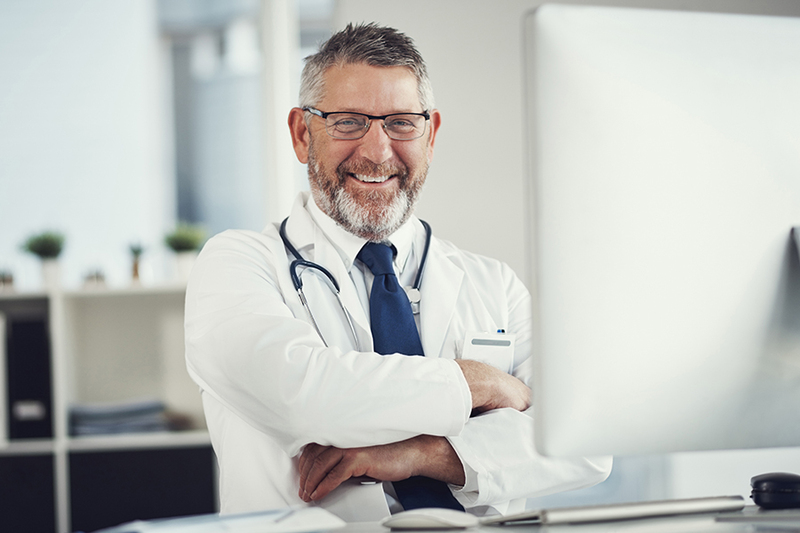 Providers no longer need to submit paper reviews, make phone calls or use faxes. Electronic submission of review requests can be done securely in just seconds and at no cost to you. AFMC ReviewPoint® also lets you quickly check the status of submitted reviews and request reconsiderations immediately. Registration is quick, simple and no administrator is required. Register here. Interested in becoming a physician reviewer? Arkansas licensed MDs and DOs can become physician reviewers for AFMC. Physician reviewers can work from home, on their own schedule, and work as little or as much as their time and desire allow. Your time is very valuable to AFMC and we compensate our reviewers accordingly. We especially need reviewers in the areas of cardiology, hematology, oncology, nephrology, neurology and surgery. Contact AFMC’s Chief Medical Officer Chad Rodgers, MD, at crodgers@afmc.org if you want to learn more. Or, you may complete an online application on our website, https://afmc.org/review/physician-reviewers/. You will be contacted if you click “Join AFMC’s membership” and complete the online application.